Pizza lovers rejoice, The Pizza Press, a leading fast-casual, build-your-own pizza restaurant, is rolling out new limited time offers just in time for National Pizza Party Day on May 18. The new LTOs will include a mouthwatering All-Beef Italian Meatball pizza topping and crisp Ace Berry Cider, which will be available May 16 through June 30. The Pizza Press is starting an aggressive growth phase with plans to bring 20 locations to Florida through strategic franchise partnerships, beginning with the opening of three locations in Windermere and Hamlin within the next year. A news release said the company also is targeting Orlando, Tampa, Jacksonville and Melbourne. Jose Colon and Carlos Orama, who opened in Celebration, Florida, are opening the first of the new locations, with Colon’s sister, Karina Colon, as general manager. Pizza Press founder and CEO Dara Maleki said the chain is seeking more franchise partnerships for future locations across the Sunshine State. The brand plans to have 30 restaurants open by the middle of this year, with a total of 300 franchise locations targeted by 2020. The Pizza Press is seeking qualified, community-minded single and multi-unit franchisees. The Pizza Press, a leading fast-casual, build-your-own pizza restaurant, has announced aggressive development plans aiming to bring 20 locations to Florida. As a new pizza concept in the market, The Pizza Press plans to ramp up growth through strategic franchise partnerships and will open three new locations throughout the Windermere and Hamlin areas within the next year. Additional target markets throughout the state include Orlando, Tampa, Jacksonville, and Melbourne. Debuting the first location are multi-unit franchise owners Jose Colon and Carlos Orama, who own The Pizza Press in Celebration, which recently opened. Colon initially fell in love with the concept on a family vacation, when his family visited The Pizza Press in Pasadena, Calif. After experiencing the newspaper era atmosphere and signature pizzas, he was driven to open a location in his home state of Florida with the help of his family and friends. His sister Karina Colon, who moved from Puerto Rico for a fresh start in the United States, serves as the general manager and oversees all of the day-to-day operations. Editors help guests create their own custom pizzas or select one of the signature pizzas named after major newspapers such as The Times, The Tribune, The Chronicle, and others. The pizzas are published in just under four minutes and can be paired delectably with more than a dozen different craft beers on tap, which change regularly and regionally. Each location offers locally brewed beers, specialized design elements, and fundraisers to provide community support—all proving to be attractive features to consumers and prospective owners alike. The Pizza Press, a leading fast-casual, build-your-own pizza restaurant, is rolling out a fundraising initiative, Sodas for Causes, on April 1 that will run April 2018 through April 2019. The Pizza Press will donate a portion of the proceeds from every fountain drink sold to Cancer for College with a goal of raising $30,000. The Pizza Press holds heavy value in being part of the community and giving back. This motivated the brand to get involved with an organization like Cancer for College, which provides hope and inspiration to cancer survivors by granting college scholarships. Since inception, Cancer for College has granted over $2.5 million in scholarships and The Pizza Press hopes to raise $30,000 to help support their mission. Article first appeared on QSR, read it here. The Pizza Press, a leading fast-casual, build-your-own pizza restaurant, is rolling out a new expanded prototype, “The Pizza Press Special Edition.” The expansion will featured an elevated beer bar experience including vintage beers, a more extensive wine list, upscale seasonal ingredients and an enhanced bar and patio, complete with a custom fire pit. The first Special Edition location will debut in Brea, Calif. in May of this year. The Pizza Press is a unique concept dedicated to elevating the build-your-own pizza model to an experiential level, by creating an immersive 1920s Americana newspaper theme in which great food, craft beer, ambiance, and service are combined. Inspired by the mechanized dough press, The Pizza Press harkens back to an industrialized era when newspapers were the foundation of the community. Each location offers locally brewed beers, specialized design elements, and fundraisers to provide community support – all proving to be attractive features to consumers and prospective owners alike. When it comes to concocted “days,” Friday will mark two that are circular, not secular, though one is certainly hole-y. We’re talking about a day to celebrate two of the nation’s most popular foods — it’s National Pizza Day and National Bagel Day. And like other made-up food holidays, it’s a day for freebies, specials and a chance to save some dough — on dough. By encouraging its business owners to think local, one California pizza franchise is quickly spreading nationwide. The Pizza Press, headquartered in Anaheim, CA, currently has 17 locations open with another 15 slated to open in the next three months. With a total of 94 units sold, the franchise wants to have 60 locations opened by the end of this year, Director of Marketing Jennifer Moore explained during a recent interview. “We’re poised for 2018 to be a breakout year,” she said. Unlike other pizza places, The Pizza Press strives to create an immersive environment where 1920s Americana, great food, craft beer and ambiance combine, Moore noted. The name The Pizza Press is a play on the dough press the restaurants use to press and partially cook the dough prior to being put in their conveyor ovens, and the press as in the old-timey newspapers of the 1920s when they were the foundation of the community. And just like newsstands which used to be on every corner, The Pizza Press wants to be involved in whatever community they open a location in. “Our franchises are locally owned and community involved and that’s a critical cornerstone of the brand,” Moore outlined. One of the key ways franchisees are encouraged to get involved with their local communities is through the universal language of good beverages and food. All locations have about 20 taps and can select from a brand-recommended set of craft beers, but importantly each franchisee is also encouraged to seek out local breweries so they can offer their own regional flavors, Dara Maleki, the Founder and CEO of The Pizza Press franchise organization, said. “We really encourage the local franchisee owners — whether they own one or 10 locations — to drive that local feel not only through ownership, but through community involvement,” he noted. Founded by Maleki in 2012, The Pizza Press opened its first store in Anaheim on South Harbor Boulevard. It opened another corporate location in Orange, CA soon after and has been franchising for about three years. Now, the franchise has a presence in seven states including locations in Southern and Northern CA; Austin, TX; and Celebration, FL just outside of Orlando. Stores are opening soon in Las Vegas, NV, Chapel Hill, NC, Tacoma, WA, and Ft. Collins, CO.
With larger development deals in Washington, Colorado, North Carolina, Florida, and Hawaii. Other focus states include: Oregon, Utah, South Carolina, Indiana, New Jersey, Wyoming, Idaho, Ohio, Arizona, Tennessee, Louisiana, New Mexico and Georgia. No matter where The Pizza Press sets up a location, the franchise is looking for someone with local roots, who is fundamentally involved with their community and who has liquidity of at least $300,000. In order to bolster its expansion, The Pizza Press offers comprehensive training and support to its franchisees. That starts with seven straight days of training at one of the franchise’s corporate stores, Director of Operations Jacob Clemons said. The new recruits are trained in every aspect of running a Pizza Press, including the operations, leadership, vendor management, core values and brand pillars to enable the franchisee to create and maintain a newsworthy experience. After that, the franchise sends corporate trainers to the local owner’s new locations for two weeks to train staff and coach them through the opening of the store. “For their first 90 days, our franchise development coach will be with them two or three times a month,” Clemons noted. The field support team will also be at sites a least once per month over the first year to make sure the new locations are running smoothly. But a core tenet of the brand is to coach and mentor franchisees as they embark on their business journey. Support actually starts even before the grand opening, as The Pizza Press will spend at least two or three days reviewing pro formas, budgeting, and helping understand lease terms, demographic propensities, and site criteria. Once they sign their lease, The Pizza Press supports their new franchisees with architecture and design help, approving layouts and setting new franchisees up with all the necessary equipment. Support also includes marketing for the grand opening and ongoing marketing plans that each franchisee can customize and localize. The franchise also sets them up with social media support and rolls out quarterly promotional packages. Landlords in places that have multiple retail shops really appreciate this because it means people are staying in their centers longer and tends to create more revenue, the franchise owner pointed out. No matter if you say “fast casual” or “casual fast,” one thing that is for sure is The Pizza Press is growing fast and they’re doing it with a spotlight on good food, craft beer and local involvement. And they’re looking for the right entrepreneurs to help them keep it going. Cookie-cutter restaurants are becoming a thing of the past as restaurant chains today seek to bring the local community alive. Pizza Press is an Anaheim-Calif.-based chain that was founded in 2012 and has two corporate locations and 15 franchised stores with 15 more opening the first quarter of 2018. Having a local feel in each restaurant has always been central to the concept’s plans. The idea, says president and CEO Dara Maleki, is to create something that makes the community proud and capitalizes on the history of the restaurant’s building. rdd: Why is it important that each of your locations has local relevance through its design? Our first restaurant opened in 2012, right across from Disneyland in Anaheim. It’s a brick building with a wood façade, exposed brick inside and out, original mill work and ornate wood details. It had an allure to it, so we maintained that building as close to the original as we could. We did a double entry to keep the window flush and the door recessed. This created a covered patio so it has an intricate indoor-outdoor feel. We also retained a “ghost sign” from an old, previous business that says, “Doll shop. Do not park” on the back-entrance wall. Our localizing is less about bric-a-brac and more about architectural elements or exterior facades and artistic touches that speak to the community. Are all of your buildings old? DM: No, in Austin, Texas, we found a freestanding old house that did not have historic value — the gabling was the only historic thing but that wasn’t. But we know Austin is proud of being Austin so we instilled the community into the building, adding murals by a local artist inside. These show the downtown skyline. It’s the small things you do within the community and within your design aspect that brings pride of ownership and of the city. None of our other restaurants have that type of artwork. How else do you localize your restaurants? DM: We strive to bring alive the feel of the cities we go into. Carlsbad, Calif., is a beach community. So, there we have an outdoor patio and lots of black and white striped umbrellas and Adirondack furniture to give it that beachy feel. In West Hollywood we have a green wall on the exterior filled with succulents, in keeping with L.A.’s ethos at the moment. At the Orange, Calif., location we had an old barn door since it used to be an auto repair shop. We want to highlight things like that. So we got a new barn door made and it looks authentic. Even if we’re not in a historic building we try to call out the community, especially if there’s a printing press or news agency. We’re currently working on a Vegas site, off the strip, and there’s some interesting cut steel so we have a reverse silhouette of the skyline of Las Vegas and it’s very throwback. We’ve also worked with the local newspaper to use historic news and bring it alive in wallpaper. For 2018 are there any new restaurants you’re particularly excited about? DM: I’m super excited for Denver and Fort Collins, which are communities that have age to them. There’s a lot of older construction, more steel, brick and other elements, creating opportunities for artistic work on the interiors and exteriors. And Tacoma, Wash., will be great; it has airplanes, the Navy and good opportunities for old headlines, too. What is non-negotiable? What must all of your stores have that doesn’t change? DM: We control the tables, chairs, booths, lighting and have standard historic images. Interiors must be white, black, brown and gold with black ceilings, black mill working and brass fittings on our sneeze guards. Taking a bite out of the $43 billion industry, The Pizza Press aims to control a larger slice of the market and build on its current store footprint – achieving 100-units awarded by 2018. The fast-casual, build-your own pizza restaurant has carved out a niche in the popular build-your-own space, offering fresh, local ingredients in a restaurant that quickly serves up a unique customer experience. With eyes set on aggressive national and international development, the brand is offering prospects exciting opportunities to be part of the company’s growth. Already with 17 locations open in southern California, Texas, and Florida, the franchise plans to open an additional 30 restaurants in early 2018. The company is also on the cusp of awarding its 100 unit– doubling its number of locations in a year and a half. Most recently, the brand has signed an eight-unit deal in Sacramento, a five-unit deal in North Carolina, a two-unit deal in Hawaii, and a five-unit deal in Colorado. UNIQUE CONCEPT The Pizza Press is a unique concept dedicated to elevating the build-your-own pizza model to an experiential level, by creating an immersive 1920s Americana newspaper theme in which great food, craft beer, ambiance, and service are combined. Inspired by the mechanized dough press, The Pizza Press harkens back to an industrialized era when newspapers were the foundation of the community. Editors help guests create their own custom pizzas or select one of the signature pizzas named after major newspapers such as The Times, The Tribune, The Chronicle, and others. Build-your-own and deliciously prepared salads, gluten-free dough, and vegan cheese topping options are also available. The pizzas are published in just under four minutes and can be paired delectably with typically more than 24 craft beers on tap, which change regularly and regionally. The brand has put an extreme focus on maintaining local relevance in new regions. 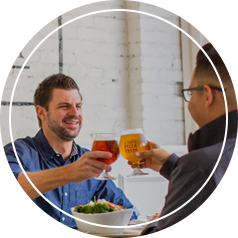 Each location offers locally brewed beers, specialized design elements, and fundraisers to provide community support – all proving to be attractive features to consumers and prospective owners alike. The franchise is offering prospects opportunities to expand in all parts of the world, developing in metropolitan markets, college towns, suburban regions, and with nontraditional locations. By 2020, the brand projects to have 300 franchise locations awarded. With 84 franchise units in its pocket, The Pizza Press is continuing its growth this year with plans for 50 openings, while awarding 25-30 more through strategic franchise partnerships. The Pizza Press has identified 2018, as a breakout year for global growth Aside from Southern California, It made progress in Colorado, Florida, Hawaii, North Carolina, Texas, Nevada, Washington and internationally in China. The brand will kick off 2018 with a total of 30 restaurants projected to open by end of Q3 and 50 to open by year’s end, tripling the number of locations open in less than a year, according to the release. The build-your-own pizza brand pins its image on an immersive 1920s Americana newspaper theme. Its growth strategy centers around multi-unit franchises, with plans for 300 franchise stores by 2020, the release said. The news media takes its share of abuse these days, but Dara Maleki, cofounder and CEO of the Pizza Press, remembers when hometown newspapers were seen as truth-telling crusaders for justice and defenders of democracy. Opened in 2012 next door to Disneyland, the chain has expanded to 16 locations in Southern California and one each in Austin, Texas, and Celebration, Florida. At The Pizza Press, pizza makers are “editors,” but guests call the shots and “publish” the pies of their choice. Naturally, we wanted to get the scoop on this unique concept, so we went straight to the source with some hard-hitting questions. PMQ: As a former newspaperman myself, I have to ask, what is the story behind Pizza Press’ newspaper theme? Maleki: When I founded The Pizza Press, the vision was clear: I wanted to create an ethos that elevated the “build your own pizza” concept to the next level. [It would be] a totally unique and immersive environment in which people could enjoy great food they had created themselves, relish friendly service, and experience a welcoming and cohesive environment. Inspired by the mechanized dough press, The Pizza Press harkens back to an industrialized era when newspapers were the foundation of the local community. PMQ: How does the newspaper theme play out in the restaurant? Maleki: Our editors help guests create a custom newsworthy pizza or select one of the signature pizzas named after major newspapers, such as The Times, The Tribune, The Chronicle and others. Those are developed by our professional chef, who also creates seasonally inspired limited-time-offer (LTO) creations to keep things topical. The pizzas are published in just under four minutes. From a decor perspective, the black-and-white theme is carried throughout, with artwork featuring old printing presses, old typewriters and other printing paraphernalia. We even carry the theme into the uniform, with the editors wearing jaunty newsboy caps. PMQ: What kind of relationship does your Anaheim location have with Disneyland? Maleki: The Pizza Press has always had a strong relationship with Disneyland, both in terms of its dedicated employees— or cast members, as they are called—and the visitors. We offer cast members 25% off their entire meal on a regular basis. Disneyland also inspired one of the pillars of our brand: newsworthy service. We believe in going beyond the standard customer service model by creating an entire theme that’s predicated on an honest, trustworthy experience, which is also a core tenet of journalism. PMQ: The fast-casual segment is a crowded one. How do you make your pizzas stand out in terms of freshness and quality? Maleki: All ingredients are fresh and locally sourced for high-quality, better-for-you food options. Vegetarian, vegan and gluten-free options are available as well. We work with small purveyors, like with our sausage, which is made especially for our brand, and we are continually sourcing new ingredients. We make our dough in-house several times a day, and we have a unique conveyor oven, which cooks the pizzas in about three to four minutes. What also sets us apart from the competition is that we are open late. Pizza makers are the “editors,” but the customers can “publish” the pie of their choice at the newspaper-themed Pizza Press. PMQ: Tell us about your most popular pizzas. Maleki: The Times (extra-virgin olive oil, mozzarella, chicken, grape tomatoes, red onions and smoked Gouda, finished with fresh cilantro and barbecue sauce) and the Tribune (red sauce, mozzarella, pepperoni, red onions, mushrooms, roasted bell peppers, sweet Italian sausage, Kalamata olives and ricotta) are our most popular signature pizzas. We also run LTO pizzas like the Buffalo Post, which is a spicy chicken pizza, and The Bulletin, which is an amazing, tangy, pulled-pork pizza. However, we encourage people to use their imagination and create what sounds good to them, with nearly 30 toppings from which to choose, more than five sauce options, and eight finishing choices. PMQ: What about your beer selection? Maleki: We put our focus on craft beers and make it a point to offer local craft beers at every location. Each Pizza Press location typically has between 12 and 24 craft beers on tap, which change regularly and regionally. We are big on beer and pizza pairings at The Pizza Press. 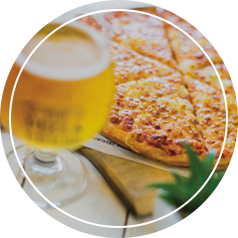 Pizza and beer are a great combination, because they can enhance or contrast each other’s flavors. It’s easy to find light, crisp beers to match with lighter, less dense pizzas topped with vegetables and chicken, or dark stouts that match up well with hearty pies topped with a plethora of meats. PMQ: You also offer beer floats and beer cocktails. What are some popular selections in that area? Maleki: Our root beer floats are made with Virgil’s Root Beer and vanilla bean ice cream. For the adult version, we recommend adding the ice cream to any of our darker beers, like a stout. PMQ: What role has online ordering played in your success so far? Maleki: We offer online ordering at all of our locations. All of the online ordering platforms can be found on our website, although some restaurants use different platforms and different delivery options (via DoorDash and the like), depending on the location. Online ordering is great for people who want to be in and out in a flash. Sometimes our customers don’t have the time to work with our editors in person to create their perfect pizza, so this gives them the option to enjoy a freshly made and delicious pizza even on their busiest days. We also just launched our app this summer, which has been a big success, with both online ordering and a loyalty program. We hope to continue to add to its capabilities for promotional tracking and redemption. PMQ: What has been the key to growing from one location to 16 in five years? Maleki: We are entrepreneurs at heart and are looking for the like-minded. I started locally in my hometown of Anaheim but quickly realized I was onto something larger. From a corporate perspective, while we’ve expanded, we’ve focused on our roots in Southern California, and that’s the reason we want franchisees. We want you to embrace your local community and be a part of bringing The Pizza Press everywhere by focusing on your own backyard. We’re taking our unique publish-your-own-pizza concept to other parts of the United States and the world, with more than 100 units sold. We’ve been operating as the dark horse for several years, and now we’re ready to break out into the national arena. The Pizza Press franchise program is the engine that fuels our commitment to encourage small business owners to continue building on this respected brand. One of our key growth strategies is targeting multiunit owners, so we offer a discount to franchisees who sign to open at least two units. PMQ: What are your plans for growth in the next five or 10 years? Maleki: Our plan is to have 300 locations by 2020 and a deep international footprint by 2025. If you’re the kind of person that eats pizza the point where you might question whether or not you bleed marinara, then this is the list for you. Pizza expands its borders by making us think of our favorite pie in new ways. Have you ever tried a pastrami pizza? Or seen a pizza piled high with so much green that at first you thought it was a salad? We’re confident that you are just as obsessed with egg everything as we are, which is why it’s become almost mandatory to see some runny yolks on pie. We know you love to talk pizza, so much so, that you start to sound a little cheesy when you talk about how much you love it. Pop into one of these pizza spots and talk pie with like minded people who are on your level. Hot off the press! The Pizza Press brings new creations and old classics to the table with roaring twenties decor and newspaper themed pizzas inspired by publications from across the country. Select one of the chef’s picks such as “The Tribune” or publish your own pizza with the use of fresh and nutritious ingredients in a flash. The Pizza Press plans to open 30 locations by early next year, and chain leadership said each one will have a local focus, unique to its area. A news release said this rather hefty feat will be accomplished in a number of ways, including offering locally brewed beers, special design and community fundraisers. “It is important to maintain locally relevant to the communities we serve as our brand continues to grow nationally,” founder and CEO Dara Maleki, said in the release. As an example of how it uses local beers to push that community connections, Pizza Press locations in California, Texas and Florida are featuring exclusive peanut butter brews at each restaurant, including Karl Strauss Peanut Butter Cup Porter in California, Sweep the Leg Peanut Butter Stout in Texas and Funky Buddha Brewing Butta’ Cup Double Brown Ale in Florida. To augment that “local taste” with a “local feel” the brand asks operators to incorporate custom design elements to each build-out through things like architectural features and art. And finally, each store hosts community fundraisers promotions, like the recent Firefighter Appreciation Days for those emergency responders who battled forest fires in Southern California. This developing chain uses a build-your-own pizza model with an immersive 1920s Americana newspaper theme inspired by the mechanized dough press, which recalls an industrialized era when newspapers were the foundation of communities. It currently has 16 open locations in Southern California, with 30 slated to open early next year, as well as nearing the 100-units-sold mark by this year’s end. The brand’s goal is to have 300 restaurants open nationally by 2020. Fashion Show mall is preparing to roll out some new quick and casual options for its hungry shoppers over the next few months. Already revealed, The Pizza Press will be bringing its Roaring Twenties newspaper-themed concept to the front of the mall, letting customers “publish” their own “original edition” pizzas, or choosing one of its in-house creations, such as “The Times,” “The Tribune” and “The Chronicle,” all ready to eat in four minutes. The concept is promised to be coming soon. Two locally created brands are also on the way. Pita + is expanding along the Strip from its current location, slightly north of the Hawaiian Marketplace. The menu includes gyros, falafel, hummus pitas, Philly cheese steaks and hot dogs. And just in time for gift giving season, L’atelier Macaron has opened a Fashion Show kiosk close to Macy’s, selling its French-inspired confections. Today and Friday, this OC Weekly Readers’ Choice winner will be offering free pizzas and fountain drinks to firefighters who flash a badge at their local Pizza Press. The Pizza Press, a leading fast-casual, build-your-own pizza restaurant, is hosting Firefighter Appreciation Days Oct. 26-27 at all California locations to show its appreciation for local firefighters in wake of the devastating California forest fires. The fires have threatened and impacted many of the brand’s locations, workers, and guests, making it a tragedy that hits close to home. Firefighters are invited to stop in at their local The Pizza Press location, show their badges, and receive a free pizzas and fountain drinks as a thank you for all they do for their communities. All California locations are participating in this promotion, including the newly opened La Habra and Tustin locations. Editors help guests create their own custom pizzas or select one of the signature pizzas named after major newspapers, such as The Times, The Tribune, The Chronicle, and others. The pizzas are published in just under four minutes and can be paired delectably with more than a dozen different craft beers on tap, which change regularly and regionally. Build your own and deliciously prepared salads, gluten-free dough, and vegan cheese and topping options are also available. The rapidly growing franchise has more than 16 locations open in Southern California with a total of 30 restaurants slated to open by early 2018. The Pizza Press poised to hit the 100 units sold mark in 2017 and plans to have a total 300 locations awarded by 2020. As the franchise continues to expand, it remains committed to the communities it serves, and could not be more thrilled to offer this two-day firefighter appreciation promotion to give back to local heroes. A pizza eatery with a “1920s Americana newspaper theme” is eyeing the Sacramento area as part of its expansion plan. A franchise group for The Pizza Press has a deal for eight locations in the area, the Anaheim-based chain confirmed Tuesday. The group is negotiating for a site in downtown Sacramento, according to the company. Other specific sites have not been determined, though they would include locations in Sacramento and Placer counties, the company said. Romo Restaurant Group Inc., a father and son partnership from Albert Romoand Nicolas Romo, is opening the local sites over the next five years. Personal-size pizzas are prepared — or “published,” in the company’s words — in less than four minutes. There’s also a focus on craft beer, and locations generally have more than 24 craft beers on tap. The franchiser has almost 16 locations in Southern California, Texas and Florida. It expects to open 30 more new restaurants by 2018. Opening a Pizza Press location requires an initial investment of between $455,350 and $791,500, according to Entrepreneur.com. The eatery will join a growing list of build-your-own pizza options in the area. Similar restaurants include Pieology Pizzeria, Blast 825 Pizza, MOD Pizza and Blaze Pizza. The sector’s growth isn’t limited to Sacramento. Fast-casual remains a hot category in the pizza industry, according to a 2016 report from PMQ Pizza Magazine. While many journalists might dream about opening a restaurant after winning a Pulitzer Prize, that’s not the case for the founder of The Pizza Press. CEO Dara Maleki has a background in international business, but he’s always had an interest in newspapers. “Press” in the name of the business also refers to the mechanized dough press that the company uses. 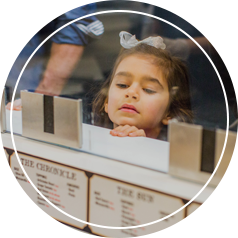 October 19, 2017 // Franchising.com // ANAHEIM, Calif. – The Pizza Press, a leading fast-casual, build-your-own pizza restaurant has carved out a niche in the popular build-your-own space, offering fresh, local ingredients in a restaurant that quickly serves up a unique costumer experience. Taking a bite out of the $43 billion industry, The Pizza Press aims to control a larger slice of the market and build on its current store footprint – achieving 100-units awarded by year-end. Based in Anaheim, California, the rapidly growing franchise has nearly 16 locations open in southern California, Texas and Florida, with plans to open 30 restaurants total by the end of 2017. Poised to reach 100-units awarded in Q4, The Pizza Press aims to build on this momentum with eyes set on 200 locations awarded by 2020 – doubling its number of units in a year and half. “This is a major milestone for our brand as we’re committed to inspiring locally-owned franchise growth to both provide a great pizza concept for customers and create a positive impact on communities at large,” said Dara Maleki, CEO and founder of The Pizza Press. “This mission paired with a sound infrastructure designed for success is what continues to attract well-suited franchise partners dedicated to growing our brand and breaking into new markets.” Most recently, the brand has signed an eight-unit deal in Sacramento, a five-unit North Carolina deal, a two-unit Hawaii deal and a five-unit deal in Colorado. The Pizza Press is also looking for further development with other strategic partners for multi-unit owners within Colorado, Washington, Florida, California, Texas, North Carolina, Hawaii and Pennsylvania. The Pizza Press has already begun international development, with a location open in China and plans to open locations in Mexico and Canada in the next fiscal year. Helping implement these aggressive growth goals is Mo Hayat who has joined the brand as an equity partner and will serve as Chief Development Officer and General Counsel. Hayat is a seasoned, results-driven executive and entrepreneur with demonstrated leadership and dealmaker skills drawing on over 20 years of industry experience. “The potential for The Pizza Press to infiltrate the category with its unique and cohesive concept in not only competitive but also lesser saturated markets is enormous,” said Hayat. “Our success is due to the brand’s superior product, unique ambience and exceptional customer experience.” The Pizza Press is a unique concept dedicated to elevating the build-your-own pizza model to an experiential level, by creating an immersive 1920s Americana newspaper theme in which great food, craft beer, ambiance, and service are combined. Inspired by the mechanized dough press, The Pizza Press harkens back to an industrialized era when newspapers were the foundation of the community. Editors help guests create their own custom pizzas or select one of the signature pizzas named after major newspapers such as The Times, The Tribune, The Chronicle, and others. The pizzas are published in just under four minutes and can be paired delectably with typically more than 24 different craft beers on tap, which change regularly and regionally. Build your own and deliciously prepared salads, gluten-free dough, and vegan cheese and topping options are also available. The franchise is offering prospects exciting opportunities to be a part of the company’s nationwide growth. The brand is looking to develop in all types of areas – metropolitan, college towns, suburban and non-traditional locations. Expanding its footprint nationwide, target development states on the east and west coasts include Oregon, Utah, South Carolina, Virginia, New Jersey and Wyoming. Development in the Midwest includes South Idaho and Ohio, and southern region development is focused on Arizona, Tennessee, Louisiana, New Mexico and Georgia. For more information on The Pizza Press franchising, call 844-84-PRESS or visit http://www.thepizzapress.com/franchising/. 5 Years since The Pizza Press “published” its first pizza in Anaheim.The first location opened in 2012.